The all-night Twin Cities art festival Northern Spark returns once again with the theme of climate, this year running all along the Green Line. 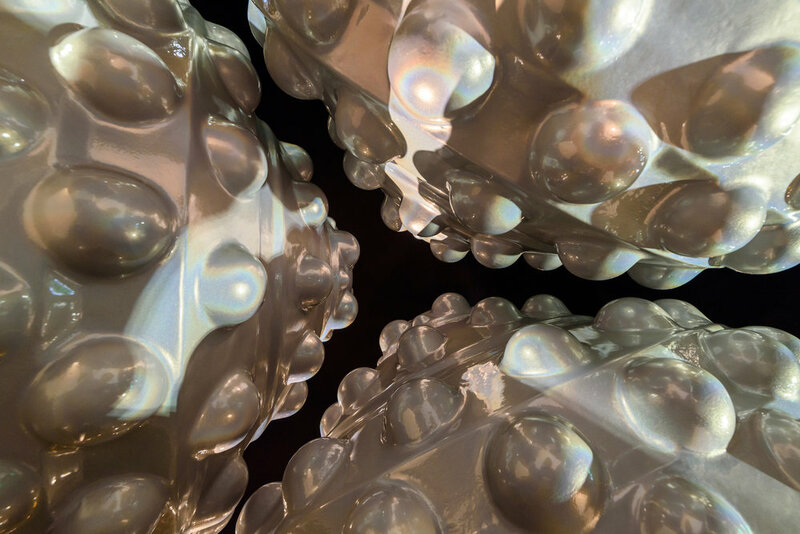 At one end Mizna and The Soap Factory will present a mesmerizing 10-foot-round sculpture by Kuwaiti artist Monira Al Qadiri, who’s featured in Mizna’s recent environment-themed journal issue with a spotlight on her first Alien Technology piece in Dubai. ‘Alien Technology’ II is a new frontier for Mizna, undertaken locally with fabrication by specialist craftsman Trever Nicholas and a long-term exhibition after the festival at co-presenter The Soap Factory. The project will start out at this year’s Northern Spark Arts Festival from June 10th sunset to June 11th sunrise. During the festival the piece will be located at The Commons Park by U.S. Bank Stadium, 425 Portland Ave S, Minneapolis, Mn 55415. After the festival the piece will be relocated outside of The Soap Factory (514 2nd St SE, Minneapolis 55414) until mid to late next year. “Big oil”–images of faceless corporations, drilling operations in far-flung territories, pipelines and spills, the Gulf of Mexico, the Persian Gulf, global industries, limited resources. But this sublimely out-of-proportion sculpture of an oil drill bit alludes to much more. Come step into its monolithic orbit; conjure its multiple meanings through a close encounter. Alien Technology II is Kuwaiti artist Monira Al Qadiri’s second large-scale piece about the Gulf’s- and her own family’s- pearl diving past, the massive oil industry that displaced it, and their shared environments, narratives and aesthetics–pearls and oil are two rare, uniquely iridescent materials. Their physical and geographic overlaps suggest deeper entwinements the artist draws us to explore. The Gulf pearl industry is invisible to most, a forgotten history after the economic transformation triggered by oil. But for possibly 2,000 years previous, the coastal Gulf economy was largely based on pearls. Pearl diving, trading, even pearl music: culture founded on a coveted resource, like oil. With entrancing colors and strange appendages, Al Qadiri’s giant shimmering drill bit also evokes bioluminescent marine life, or some futuristic organic machine–alien technology, forged here through a history of pearls, an era of oil, and an environmental future open and unknown. From sunset on June 10 to sunrise on June 11, Northern Spark 2017 is a free all-night art festival exploring the effects of climate change through participatory projects happening in neighborhoods along Metro Transit’s Green Line, connecting Minneapolis and St. Paul. Experience the largest Northern Spark yet, with nearly 70 art projects organized around neighborhood nodes: Cedar Riverside/West Bank, Weisman Art Museum/East Bank, Little Africa/Snelling, Rondo/Lexington, and Little Mekong/ Western. In downtown Minneapolis the festival moves from its usual river location to The Commons, the new green space at Portland and 5th, and culminates in Saint Paul at Union Depot, the Green Line terminus in Lowertown.